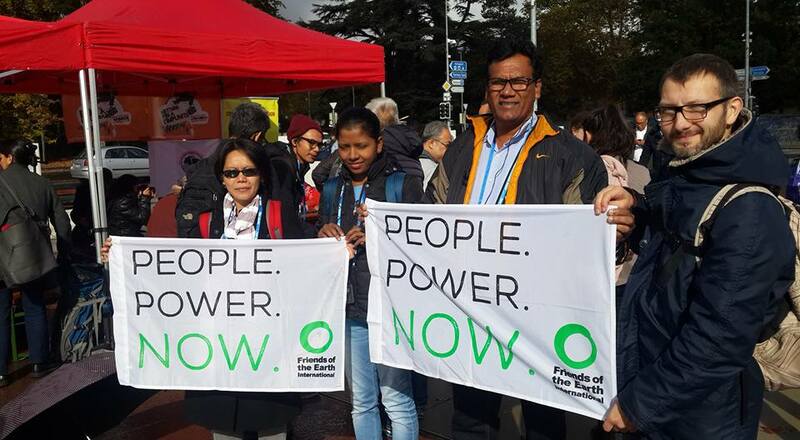 Hemantha Withanage, Executive Director of Centre for Environmental Justice (CEJ) – FoE Sri Lanka was part of a session panel titled Voices of the Victims at the UN Treaty on Transnational Corporations Session in Geneva, Switzerland. Hemantha highlighted 2 main cases from Asia Pacific, 1 from Sri Lanka and the other from Philippines. He also raised the issue of how international financial institutions were protected by immunity leaving affected communities to raise redress and grievance through IFIs own accountability mechanisms only. These mechanisms are not enough to protect affected communities. Hence, the reason why we need a binding treaty on corporations is badly needed. Read the full speech at the UN in Geneva below. Mr. Chairman, It is extremely sad to see that we are losing control over our body, our culture, nature and the livelihoods. Neoliberalism remains the dominant global economic paradigm, despite the failed policies of privatization, deregulation and corporate globalization. It has led to the inability of states and governments to regulate the economy and protect the commons including the natural environment. Some of the great difficulties and threats created by the current system are faced by the women and men who defend the territories they have constructed historically and with the wisdom of our ancestors. People are in a much more crisis when they don’t have the rights to make decision over its own body, with respect to labour, sexual or other forms of exploitation, discrimination and disrespect. Transnational Corporations have taken over the decision-making role over all these territories, spirituality, ancestry and even our culture and our natural resources through commodification. The pollution of our water, air, soil, food and destruction of our forests, rivers, wetlands are all part of this crisis. I will cite few real examples to give you an idea of the extent of this crisis. Mr. Chairman, We all know Water is a human right. The Human Right to Water and Sanitation was recognized as a human right by the United Nations General Assembly on 28 July 2010. The Universal Declaration on Human Rights of 1948 and International Covenant on Economic Social and Cultural Rights of 1966 implicitly recognized the Human Right to Water. But the MARCOPPER MINING CORPORATION in the Philippines violated this right two decades ago with the 25 million USD loan extended by the Asian Development Bank for mining operations in the island of Marinduque, in the Philippines. In March 24, 1996 a drainage tunnel of Marcopper cracked, spilling millions of tons of mine tailings into the Boac River. The United Nations investigated the extent of the impact of the spill and identified unacceptable levels of heavy metals and toxic wastes in parts of the river. This river had been an important source of food for the residents of Marinduque. Many residents suffered illnesses because of the toxic wastes which had been accumulating in the province’s tributaries ever since Marcopper started operations in 1994. In April 2001, a case for recovery of damages was filed in the local Court by affected residents in Marinduque against Marcopper. After 16 years, the case is still in the trial stage and will most likely be dragged on for a few more years due to the financial and technical resources available to mining company and the inefficiencies of the justice system. Some plaintiffs have already died without getting due reparations. Other plaintiffs are senior citizens experiencing failing health. Aside from delays in the judicial system, Marcopper may also be able to escape liability by declaring itself insolvent and unable to pay the damages sought by plaintiffs. UMA OYA RIVER DIVERSION PROJECT in Sri Lanka is an ongoing example for a criminal act and human rights violations. 22 km long tunnel is being constructed under the eastern side of the mountain range in Sri Lanka damaging the groundwater aquifer since 2013. More than 7500 houses are being cracked and some are sinking into the drained water aquifers and the tunnel and more than 50,000 people are being denied access to drinking water. Several kilometers of the rivers and streams including part of the Kirindi Oya(river) have been completely dried up. Many families, women and children are living in those unsafe houses which might fallen in any moment due to heavy rain. Vegetable and flower farmers have become development refugees and now serve as the labourers in the construction sites in the cities. The damage is much higher than the total value of the project. There is no adequate legal remedy through the court and very little compensation has been delivered so far. No compensation has received for over 90% of the affected people. Mr. Chairman, The long history of human rights violations perpetrated by Transnational Corporations and/or their agents have been documented worldwide. Such violations include extrajudicial killings, enforced disappearance, and other forms of harassment. Moreover, TNCs have caused colossal damage to the environment, leaving local communities unsafe and without sources of livelihood. Extending liability to IFIs will mitigate the difficulty in holding TNCs to account for their violations, as well as in identifying the transnational character of companies. Lack of due diligence, weak safeguard measures, weak environmental impacts assessments process, lack of listening to public voices and lack of good governance and the unavailability of the legally binding instruments are few reasons for this damage. IFIs such as ADB, WB, IaDB, EBRD and the AIIB have been obligated to establish Environmental and Social Safeguard Policies. These policies have emerged through decades of pressure from civil society and project affected communities pushing IFIs towards taking environmental and social responsibility of their lending operations and consequent adverse impacts. Local communities have often questioned these policies in their implementation and scope, as various IFIs fail to deliver their respective safeguards. The ADB’s own Independent Evaluation Department in a report in 2015 identified widening gaps in ADB’s safeguards policy and its implementation mechanism. As the IFIs are protected by immunity, affected communities can only raise issues of redress and grievance through the IFIs own Accountability Mechanisms. These mechanisms serve as the only institutional platform through which project – affected people can elevate their grievances and call for remedy against harm and damages caused by IFI projects. Thus, lack of real remedial action on the ground and tedious and lengthy complaint filing and investigation processes leave local communities completely dependent on IFI responses, as immunity leads the courts and national judiciary to be inaccessible for harmed local communities. With weak safeguards delivery and inefficient grievance mechanisms IFIs are left unaccountable of their actions. There needs to be a binding treaty, which yields IFIs to be accountable. As all IFIs are investing public funds there has to be a way for them to be accountable to the public. In the era of climate change, inequality and the new Sustainable Development Goals, the only way IFIs will be made responsible is through binding checks and balances in their operation. At present the immunity privilege of IFIs poses as a fundamental obstacle to their accountability and leads to an increased threat of harm from their actions in the future. I propose there should be no immunity to the IFIs. Similarly, the tribunals or the accountability mechanisms do not have teeth to tackle these issues. Thus, governments have no rights to give away our territories and natural resources to TNCs against the wishes of our communities who hold the right over such territories. The TNCs or the IFIs are not the owners of our resources and our nature. They should be liable for the destruction of our territories. The UN Binding Treaty should be able to establish liability of IFIs that knowingly fund and continue to support companies responsible for human rights violations and environmental disasters. This will provide another layer of protection for those aggrieved by abuses committed by TNCs.